C’mon Really how good are Body Weight Exercises? As a Personal Trainer I get asked all the time by busy folks what they can do when they can’t get to my Studio or to the Gym in order to keep up their fitness program. Like them you may have the same question. Fortunately, there’s great equipment that can provide a full-body workout, and it won’t cost you a thing. Wondering what this magic solution is? Just take a look in the mirror and Boom, there it all is! Yep, Body weight exercises, which rely solely on your body’s own mass to provide resistance, are growing in popularity and were even named an “emerging trend” in fitness by the American College of Sports Medicine. Best of all, they can get your entire body toned without the need for laying your hand on any fitness equipment. What Is Body Weight Exercise? Despite the American College of Sports Medicine recommending that adults perform strength training exercises at least two days per week. Only 21.9% of men and 17.5% of women say that they reach this goal. I truly believe trying body weight exercise is a great way to get started or help in maintaining strength training to meet physical fitness goals. So what, exactly, is body weight exercise? Simply put, this form of exercise uses the body — rather than free weights or cable machines — for resistance. In fact, you’ve likely performed body weight exercises without even knowing it. Take crunches, for example. A typical crunch requires you to use your abdominal muscles to work against the resistance provided by the weight of your torso. Thus, without using any additional equipment, you can strengthen muscles using just the resistance from your body. How Does Body Weight Exercise Improve Strength and Muscle Tone? Seasoned gym-goers sometimes scoff at the notion that body weight exercises can be effective in building strength and toning muscles. They think something so simple couldn’t possibly be as good as hours spent in the free weights section. However, variations on traditional exercises allow a person to exert additional energy and build muscle mass. In general, increasing the number of repetitions performed will improve endurance. To build strength, it’s important to increase the intensity of the exercise. One great way to do this is to decrease leverage; for example, lying on an incline bench makes it more difficult to perform crunches. Additionally, working at the ends of the typical range of motion effectively builds strength. Try slowing down your crunches, focusing on exerting your abs throughout the full range of motion — particularly at the end of each crunch — to improve muscle tone. It’s free. Perhaps the biggest draw for money-conscious exercise enthusiasts is that these exercises are free to perform. After all, you’re already carrying your body weight through the world. Why not put it to use for your fitness and health? Increased flexibility. Strength training exercises often come with tight muscles and inflexibility. As most body weight activities encourage use of a full range of motion, this improves joint movement and general flexibility. Better balance. Body weight exercises rely on the typical movements of the human body, which often engage core muscles. This leads to improved balance and better body awareness. They’re safe at any age. Injury is one of the most common reasons that people quit their strength training regimens. Additionally, middle-aged and older adults are often intimidated by strength training. Because they wrongfully think that it will result in injury. Although it’s certainly possible to overdo it with body weight exercises, they are unlikely to lead to the types of injuries often seen with other noninstructed weightlifting activities. In fact, physical therapists often recommend body weight exercises for rehabilitation following sports- or exercise-related injuries. For the exercise excuse-makers among us, “I didn’t make it to the gym” doesn’t cut it anymore. At home? In the office? On the road? It’s still possible to find time for a fast workout that targets the entire body. Compound movements. Unlike certain machine- or free weight-based exercises that target specific muscle groups, body weight exercises often require compound movements that engage numerous muscle groups. Compound movements are great for building strength and improving general physical performance. Push-ups may seem like a beginner move, but they remain one of the most powerful body weight exercises to improve upper body strength. It primarily target the pectoral muscles (chest), triceps, and deltoids (shoulders). However, they also engage the abdominal muscles, building your core strength. To complete a push-up with proper form, begin with your hands beneath your shoulders with fingers facing forward. Gently lower yourself, keeping the head, neck, and back straight, until your upper arms are parallel with the ground. 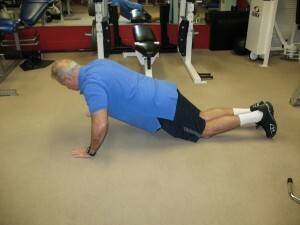 Then, using the chest muscles, push upward to return to the starting position. If you’re a beginner, try starting with your knees resting on the floor, which reduces the body weight needed to perform the exercise. 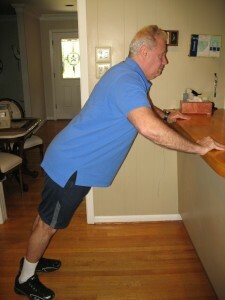 Alternatively, standing on the floor leaning forward with hands on a couch or countertop is another great move for beginners. In contrast, those who want to make push-ups more challenging may consider placing their feet on top of a small box. This change in elevation requires more force to achieve the push-up motion. The body weight squat is a fantastic exercise to target the quadriceps, hamstrings, and glutes (they also engage the calves, abs, and back to a lesser extent). Begin by standing with feet shoulder width apart. Being careful not to let the knees extend past the toes, sit back until your thighs are roughly parallel to the floor. Push upward, engaging your leg muscles to return to the starting position. Repeat for 3 sets of 10. More advanced exercise buffs may want to challenge their lower body with jump squats. 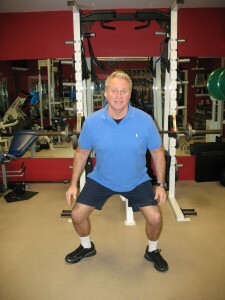 From the lowered position of a regular squat, jump explosively into the air. This variation on the squat builds leg strength and overall power. 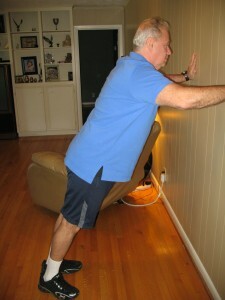 In addition, you can do the exercises in an alternating manner, i.e. a cycle of 10 Push-ups and then 10 Squats with a 10-30 second rest between cycles going back and forth for 3 to 5 sets. Also a quick note, the tempo should be 1 second up and 3 seconds down, you can use a 2 up and a 4 count down. In the beginning you may only be able to complete one cycle, and as your fitness level increases you will be able to add in additional reps and cycles as this occurs. Something else you should consider doing is utilizing these types of exercises while at work. Many of us sit for way to long of a period of time. 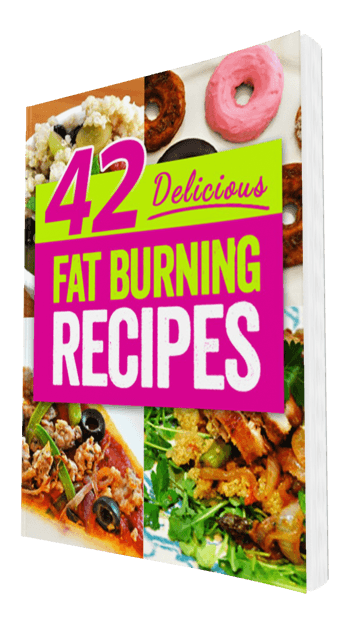 By the way, are you aware that after only 2 hours of sitting our most crucial fat burning enzyme “Lipase” is down regulated? Yep, not cool, and in order to keep its level up regulated and your metabolism chugging along all you have to do is get up out of that chair every 25-45 minutes and do about 10-15 body weight squats, or 10-15 push ups maybe off the side of your desk, then Bam, you will have kept your lipase and fitness level up. Think about it for a sec, at the end of the day you may have completed perhaps 30-50 Squats and 30-50 Push ups, not to bad and pretty cool as well. When you add this in to your daily activities and build it into a habit, then when you are able to get back into the Gym for a good solid workout you will be in much better condition to do so as well as to getting a much Bigger bang out of the time spent there! Cool, eh? I’d have to say way! I would love to hear your thoughts, so please leave a comment below.